1) Both conservative and liberal leaders often rate him as the 20th century’s most influential theologian. 4) Before you criticize him for #3b, he was among the very first to smell the rat that was Hitler and to write to Christians (and everyone) with severe warnings, ultimately becoming primary author of the important Barmen Declaration which at least supported the small proportion of German churches that opposed or resisted Hitler. Refusal to sign onto support of Hitler got him kicked out of Germany–we’re lucky he was Swiss. I figure anyone like that might have something useful to say once in a while. 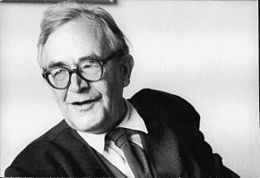 Any impressions about Karl Barth? Any curiosity? ← Do You Experience God? As Holy Spirit? Reading him at the moment (Dogmatics in outline) but really too early to get a strong impression. He has a certain way with words even in translation. Definitely prophetic rather than apologetic.